Mostly known for his large contract and Jeremiah Johnson hairdo, Jayson Werth has become a legit All-Star on the giveaway circuit. 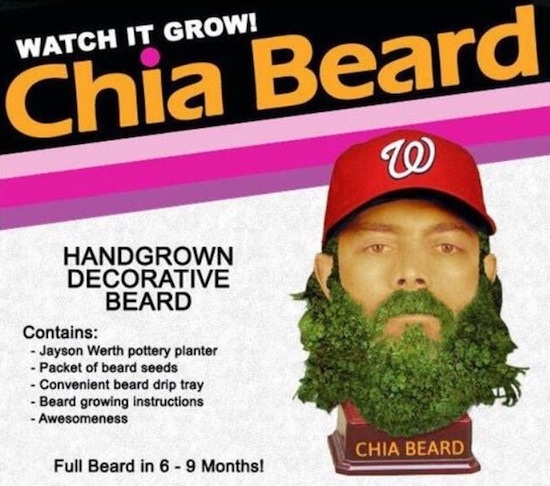 The most recent option is a play on the timeless Chia Pet and presents Werth's beard as a living plant. The Werth Chia Beard is part of a promotional giveaway from the Washington Nationals for their August 5th game against the Arizona Diamondbacks. The Jayson Werth Chia Pet was available to the first 20,000 fans and features the familiar clay color on a bust that greatly resembles the MLB player, including cap and sunglasses. 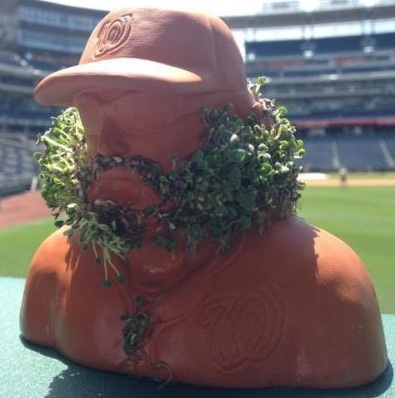 Like all the other official Chia Pet options, Werth's beard will take some time to grow to a familiar length, but fans and collectors will be rewarded if they follow the instructions. As seen in the image below, a little chest hair is even in the mix per a suggestion from Werth himself. Early eBay pre-sales for the promotion were around the $40-50 range. As the live figures are listed and the exposure grows, the prices should remain strong. While it is not technically a bobblehead, the Chia Pet is part of an increasing push by teams to be creative with their giveaways. The 2015 bobblehead lineup is full of intriguing options, but this might best them all. Clearly the Jayson Werth Chia Pet is unique, but this is not the slugger's first brush with giveaway fame. In recent years, Werth was featured on a popular bobblebeard that rarely surfaces and a garden gnome that still sells for around $100. Because of this, no matter his ultimate legacy on the field with the Nationals, Jayson Werth has likely earned a spot in the giveaway Hall of Fame. Jayson Werth Chia Pet Washington Nationals SGA never opened !